Whether you’re just getting started in high school sailing or are looking to compete on the top levels, you will find that good tacks are essential to success. Let’s look at the mechanics of a good roll tack in the 420 and Flying Junior and some drills you can do to practice your tacks. The initial consideration is making sure you have a good reason to tack. Before you tack, be sure you look around and consider puffs, windshifts, windshadows from other boats, and your position relative to the mark. Tacking because you’re bored or because the sun is shining on the other tack probably isn’t going to get you to the front of the fleet! 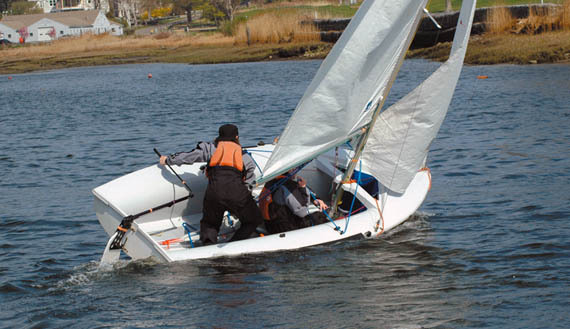 After a good tack, you should quickly get your boat back up to speed – if you come out faster than you’ve gone into the tack, you’ve broken Rule 42. Have your sails trimmed, and look around so you can prepare for the next puff, windshift, or mark rounding. If you’re skippering a 420 or an FJ, you need to be aware of timing, rudder movement, sail trim, and weight placement through your tacks. Going into the tack, trim the mainsail and let the boat heel slightly to leeward in order to help the boat head up, then gently push the tiller toward the sail to maintain your speed. Once the jib starts to backwind, snap your shoulders out to roll. It’s very helpful to call the timing for your crew: “3-2-1-roll” works well. Lock your forward foot into some part of the boat – either the traveler bar or underneath the mainsheet block – so you can throw your shoulders out. Keep your aft foot bent against the airtank as a spring to push off as you quickly cross, switch hands, and flatten the boat. As you’re flattening, trim in the mainsail because your apparent wind will go forward as you come out of a good tack. A common error is to oversteer through tacks, so after your tack, be sure that your telltales are both flying straight back and that you are sailing a close-hauled course. Crews need to be attuned to timing, sail trim and weight placement while tacking. Have both jib sheets in hand before the tack, and make sure that you have a good foothold to roll off of. In a 420, this may mean sliding back to lock your feet under the thwart. In an FJ, some crews prefer to tack facing backward, which allows you to move your weight forward, see when the skipper is rolling, and find a more comfortable foothold. As the jib breaks and starts to back, throw your shoulders out against the rail. In light air, try to get your shoulders out far enough that your lifejacket gets wet as you snap outward. Taller crews will want one foot on each side of the centerboard trunk, while smaller crews can roll with both feet on the same side of the rail. Regardless of height, you need to have quick footwork to roll and cross the boat to help the skipper flatten. As you’re moving across the boat, your motion should trim in the jib, but try to be aware that you need to be trimming as quickly as possible. If the boat is powered up after the tack, you can stay on the rail, but in medium and light air, you may need to jump back into the boat so as not to overflatten. How can you practice tacks? It is one thing to be able to tack well when you and your crew are ready and focused on getting everything right, but in a race, you may not have the luxury of being able to think only about tacks. 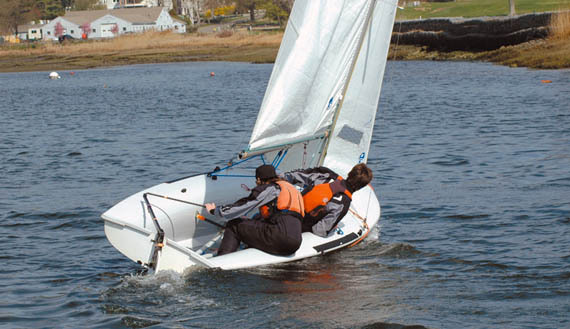 Thus, it’s important to practice tacking on short notice and in situations when you would not ideally like to tack, such as in waves or in a lull. The most common tacking drill is ‘tack on the whistle.’ This drill works with one boat or many. Whenever the coach (or friend – anyone in another boat with a whistle will do) blows the whistle, you must tack. 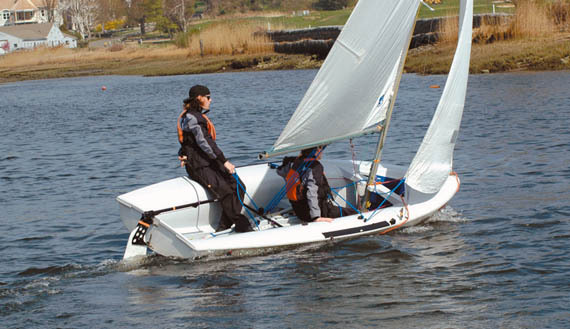 Your coach should keep variety in the drill – sometimes allowing you to sail several minutes without tacking and sometimes having you tack a few times in a row. With several boats at your practice, you can do the ‘blender drill.’ This drill starts with a rabbit start, after which boats can tack at any time, but may not sail more than two boatlengths from the pack. Thus, you will be forced to tack often and maneuver amongst other boats. If one boat gets ahead, that boat should do a 360 or 720 to get back in the mix. 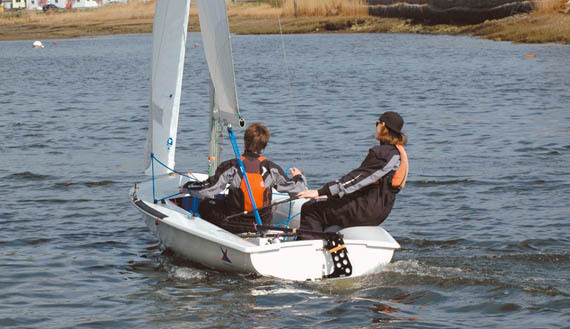 This drill does not require a coach to get started, so it can work well as a way to warm up as you and your teammates sail from the dock to your sailing area while a coach sets a course or helps stragglers get off the dock. Good tacking is difficult, but time spent perfecting your technique can pay huge dividends over the course of the spring and summer seasons. Clemmie Everett teaches History at Rye Country day School in Rye, NY and is the Assistant Coach of the school’s Varsity Sailing Team.